Throughout Utah, hundreds of individuals will not return home for the holidays. Grievously, this has nothing to do with them living wildly successful lives elsewhere, and more to do with how their families will spend part of the holiday adorning their grave with a wreath—instead of watching them unwrap gifts by the fire. As someone in the midst of grieving the death of my brother, I feel for these families. And wonder if they (like me) are struggling to find the magic of the season. Last Christmas marked the moment I felt forced to acknowledge I was on borrowed time with my brother. During our visit he was tired, even during the present unwrapping. When we left earlier than anticipated so he could rest, I knew it was my last Christmas with him. People have always asked me if having a little brother with cerebral palsy changed our relationship. Since he's the only sibling I've ever known, I could never really answer their question. For me, our relationship was normal. At least, it was my normal. The fact that he could not walk or talk may have changed how our bond appeared to the outside world. However, it did not stop us from making each other laugh or getting on each other's nerves—the way all siblings do. Though I will admit, it is strange to know that your younger brother will die before you, and even with his health failing and feeling as though I could hear the clock ticking. It was still a shock when he passed before the first week of 2017 came to a close. To have the oversized jersey knit Ute blanket I bought him for Christmas—to replace his worn fleece one—back at my house a month after I'd wrapped it was surreal. Six months prior to his death, a close friend lost her brother to one of the two major plagues preying on Utahns of all ages and backgrounds. Currently, the state ranks seventh in the nation for deaths caused by both opioid overdose and suicide. During our days taking turns leaning on one another, I realized, despite our circumstantial differences, that our grieving was intrinsically the same. We were still raising children and holding down the fort, while struggling to find the energy to get out of bed. In addition to the usual suspects of grief, devastation coupled with feelings of guilt, regret, anger and the never-ending ache of emptiness. We also struggled with feeling helpless as we watched our parents grieve. Yet, in light of how similar our grieving process has been, I have found myself deeply bothered by the lack of sympathy she's given in regards to how some responded to her loss. You see, society appeared to deem the death of her sibling as "a waste," while deeming mine "acceptable." On one hand, I understand why a person dying from suicide or an overdose can force our minds into panic as we try to make sense of why it happened. On the other, if anyone implied any aspect of my brother's life was ever a waste, the only Christmas miracle saving them from being punched in the throat would be my fear of assault charges. Regardless, if the deceased reached the end due to side effects of a disability, from committing suicide during the throes of depression, or by unknowingly taking their last hit while struggling with addiction, the coping process for those who remain is essentially the same. 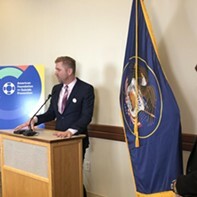 The Utah Suicide Prevention Coalition says there is a suicide in Utah every 16 hours and opidemic.org finds opioid overdoses result in six deaths a week. Even with this volume of deaths, there still seems to be a great deal of stigma—as much for the deceased, as for those they are survived by. This stigma strikes me as odd. When it comes to grief, there is no hierarchy in how we die. This is not ancient Rome; there is no such thing as a noble death. Condolences with a side of judgment are both unfounded and unnecessary. For most, a sibling is their first best friend. When they pass, it's not the time their health was deteriorating that floods the mind, but the memories of growing up together. How my brother passed does not alter the reality that part of me died, too. In our youth, the holidays provide respite from our bad dreams. Miracles consist of the toy that seemed too far out of reach or the stuffed animal you thought was forever lost—only to find them awaiting you underneath the Christmas tree. As adults, instead of washing away our worst days, holiday festivities magnify them as we attempt to cope with the empty seat at the dinner table and wish with all of our being we could hear our loved one's laughter one last time. While I'm not sure I will find my Christmas spirit this year, sometimes I think the real miracle was that my brother was part of my life at all. I just wish such sentiment helped alleviate the pain of life without him.